1. Am I thinking about this as a Christian? 2. Do I have my facts right? 3. Do I know any immigrants? Several presentations were given each addressing these questions/topics. 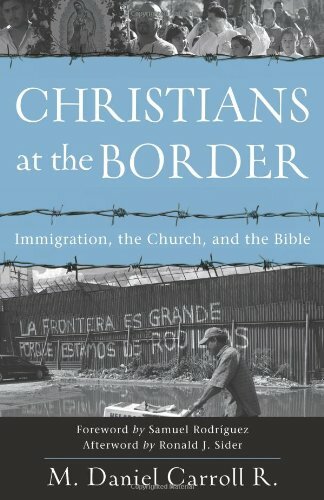 For the first, Dr. Daniel Carroll, author of Christians at the Border, (a straightforward book about the biblical issues involved in the issue of immigration) shared a biblical theology (of sorts) of immigration. Here is a quick summary. Usually when immigration is discussed, it is first done so in the context of economics. If we were to think about this biblically, how would it change the tone, direction, and content of the conversation? Most Xians are often hard pressed to cite biblical passages that speak about immigration. Most conversations start with Romans 13 concerning submission to government authorities, but perhaps this is where we should end, not begin. A good place to begin is to talk about the image of God (Gen 1:26-28) in both an ontological and functional sense– ruling on behalf of God. There are several implications for immigrants: instead of seeing them just as a burden, we begin to think functionalyl – how do we position, harness them as resources? I had some questions here because such a perspective can easily be skewed into a post-industrial assessment that a person’s worth is based on function – what they can do vs. who they are intrinsically and relationally. Joseph – forced immigrant, trafficked. Episode of Potiphar’s wife – falsely accused and imprisoned b/c he is an immigrant. Never forgets his mother tongue or his culture. Naomi/Ruth – Naomi decides to return after her father and sons die. The entire process of gleaning the fields is a provision of the sojourner. Ruth is never recognized when Naomi returns to Bethlehem. Boaz wonders who Ruth is. She is labelled as the Moabitess, the hard-worker. She is not named! The entire book ends with the genealogy connecting Ruth’s story to the larger story of David. Dr. Carroll then did something very helpful not just for understanding immigration, but also the Scriptures (he is an OT prof after all). He began to talk about the Law’s usefulness for us today. The Law: the current Marcionite conception of the OT puts Christians at a real loss when it comes to reading the OT and its voice to shape how we’re supposed to think about society. Nature of the law – more than just dealing with sacrifices for sin! Much of the law has to do with civil regulations and culture-forming. We must think about what values are reflected in the laws! Law reflects the heart of a culture. What are the implications for other cultural hot-button issues such as homosexuality? Can we just claim the law as culturally-informing when it comes to immigration? Key question: how does the law treat the vulnerable? Vulnerable because of a lack of extended family. In the ANE, extended family was the societial vehicle by which social services were provided. B/c no land – land was everything! Law provides for food, labor: rest and wages, justice, inclusion in worship, expectations. Love your neighbor- the ultimate test is to love the one different from you! Historical memory – you were once a sojourner. Remember how you were treated in Egypt. Don’t forget where you came from (socio-economic, political things that happened). Once you forget the story of the hardship, you will repeat the same mistakes with the next newcomers. As a reflection of the personal character and commitment of God (Deut 10:17-19). His homerun point was that once you begin to see how the theme of sojourning (immigration) permeates the OT, the metaphor of being a sojourner really begins to apply to the journey of being a Christian in the world. Christian faith cannot become an American ideology – the land loses its strangeness, and we forget we are sojourners. Another good reminder for me was that when most people think of undocumented immigrants, we think of – let’s be honest – Mexicans or other hispanics – crossing a river, scaling a fence, running through a desert. The truth of the matter is that although Mexicans make a good deal of undocumented immigrants, there are PLENTY of Asian undocumented as well, and there are plenty of undocumented immigrants who entered the country LEGALLY and overstayed visas thus making them undocumented. All things to consider as we face our own prejudices and biases regarding this hot-button issue. The next teaching session had to do with facts and figures concerning immigration and the history of the U.S. immigration policy. It was an eye-opening presentation dealing with a lot of myths and misconceptions about undocumented immigrants, and their effects on society. I’ll post a summary of that if there are enough comments/request to do so. >I would like you to post the summary, I feel very strongly about this issue, but often wonder if I have enough facts to really have a strong opinion. More info please!